Do take care... cutting out broken glass takes patience! And lots of hand strength... wear eye protection... and do frequently switch out single edge razor blades... Look into the array of holders for same... worthwhile. I just picked up a tank as old as me (and probably older but they were still making these in my early childhood, but I digress...). It is a metal frame tank that has the back pane broken and although I want to retain as much of its character as is practical I also want to keep from breaking the bank. Since I am creating a 3D background anyway I am going to use 1/2 or 3/4 inch plywood in the back which will be painted with acrylic or a thick coating of silicone. It is my intention to use a putty like 2 part epoxy used for potable water vessels around the back panel. I have used this in a sump that not only held water but took care of some very healthy fish. Once the epoxy cures I will then silicone all joints in the tank. Does this sound reasonable? <Oh, wow; this is an olde tank. Can you make out any marks of manufacture? and I would think is stronger than the tempered glass in today's 55 gallon tanks. I know they used a tar solution to seal these. I understand there were a few such tar sealants used depending on the age/manufacturer of the tank. The only possible clues to this tank's age are the (at least) 1/4" thick glass and the two braces on the bottom part of the frame. This tank was indeed built like a tank! Pun very much intended, but also very true! Thank you for your help. Oh if there is any good reading material you know of for this particular situation please let me know. This tank is indeed 48x18x13. I will look into the cost of actually getting a new pane made. Either way this aquarium is going to be put pack into service. Thank you as always! Actually I take that back, it is 48 x 22 x 13. I had to double check that. I don't know why I thought it was only 18 inches. Thank you Bob! My fish tank cracked, but it's still completely watertight. Is it okay to leave it the way it is, or do I need to replace it? I'm 16 and unemployed, so I really don't want to replace it if I don't have to. It's a 10 gallon tank with two baby goldfish in it. Yesterday I purchased a 100 gal Flat Back Hexagon Glass Aquarium from a yard sale for 15$. The tank had been stuffed in the backyard in a corner under a tree upside down for at least 3 years. I was told that the tank had a leak in the past and it had obviously had an application of sealant on all the inside seams. This was just new silicone applied to old. So I purchased it took it home and scrubbed the years of dirt away. I have been looking for a larger tank for sometime now and after my tank was looking spotless and scratchless, I begun to fill it with water. Now I had never worked with a tank this large before or heavy ( This tank is a beast I almost made my girlfriend cry cuz she couldn't help my lug it out of the backyard into my truck. Luckily I enlisted the help of another yard seller.) I was pleased that the tank filled to the top and held water. This was probably one of the happiest days of my life seeing this huge tank filled up and looking pretty. I decided to leave it full to see if it was leaking. Long story short my happiest day was cut short about an hour later as I heard a huge thump coming from outside and to my dismay there stood my tank empty of water and all of my happy fish dreams dashed. It could have been worse I probably would have paid $100 for the same tank. So I realise that one mistake I made with such a large tank was filling it up on the lawn ( uneven surface) I was thinking it when i was filling it and shrugged it off. Anyways upon further inspection I'm left with still a very pretty but empty tank that seems to have blown just the back glass panel out completely. 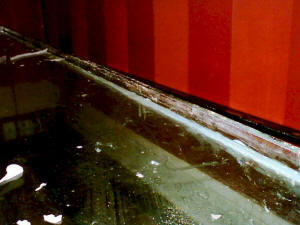 I removed all the broken glass and scraped away most of the silicone. My question is: Would it be a worthwhile to invest the time and money to purchase a new back glass panel? Can I convert it to a reef tank setup by having holes put into a new piece and resealing the whole tank? What procedures are used when building a flat back hexagon tank ( Clamps Etc)? Is it possible to add an overflow to this tank somehow? I have been working with saltwater tanks for about 25 years now, (biggest 60 gallon) and would like to build a huge happy reef tank! Should I just turn it into a heavy snake cage with a plywood back or perhaps a winter vegetable box in the garden? <Mmm, I'd Silicone in a thinnish piece of acrylic (1/8" will do)... with plenty of lines of Silastic twixt it and the shattered bottom... If it's too hard to fit in the new piece (cut away the existing sealant on all bottom seams), it can be cut (by others if you want) in half or quarters. I wrote about a year ago concerned about my Bala shark with a broken jaw. Ended up having to put him down. However I am in the process of setting up a new tank for the remaining sharks, and this is where the question comes in. I purchased a used 400 gallon glass aquarium, and am in the process of tearing it apart for a few reasons. 2- one of the seams is giving out, so it needs to be repaired anyway 3- I cannot carry a 1000lb tank. 250lb sheets are much more manageable. and it was joined to the side panels with a rabbet joint (made out of two 1/2" sheets Siliconed together). Strong, but a royal pain to remove. I have gotten the top off, but there were a few spots where it had some bad chips and the smaller pieces cracked. The top was similar to a eurobrace. It is two 1/2" sheets glued together, about 4" wide, running the perimeter of the tank, with two 18"w cross braces of 1/2" glass. The 4" wide portions are staggered so they overlap, each piece is only about 2-1/2' long. I apologize if this makes no sense at all, I can provide a picture if need be. The obvious answer is yes, I think the better idea is to replace it with 3/4" (I always assumed you wanted to top brace at least as thick, if not thicker than the sides), but I had another idea. We have a construction salvage yard here that sells various panes of glass for very very cheap. Would it make any sense to silicone smaller panes of glass together, say a few 3/8" panes with an identical footprint, sandwiched together, or is this a disaster waiting to happen? The only parts I have left on the tank are the sides. I have started using a product called "Goof Off" that contains xylene, acetone, and benzene to help soften the silicone. The sides were clamped so there is not enough room to even fit a razor in some of the seams (I have a few parts of broken razor blades stuck in some of the seams still). A slow process but I am making progress. I tried fishing line and guitar strings, both of which break after a few inches. I think the inside edge of the glass is not sanded. once more with a razor, then Goof off and a coarse scrubber, and then wet sand it very lightly. to hold it upright, then applying silicone in all the seams and clamping. Once clamped I will apply it on the inside seals, while the silicone is still wet. Do you see any potential problems with this idea, or have any suggestions? Do you think the spacers might jeopardize the integrity of the seal at all? And one final question, the tank is drilled with 1-1/8" holes on the bottom. The owner of the fish store I got it from told me that bulkheads were no longer sold in that size. I have found quite a few for sale that say they require a 1-1/8" hole at several commonly known online fish supply stores. Am I missing something or was the owner just mistaken? I apologize for the lengthy email and am grateful for any assistance you can provide in this matter! Just a few questions to clarify, I am a bit confused on a few points. Is Silastic you reference different or preferred over normal silicone? I was only able to locate a product made by Dow "*Silastic* 100% Fluor Liquid Silicone Rubber". In all the projects I have done in the past I have always just used GE Silicone 1. The portion where the top brace cracked I probably should have specified. It will have close to a 1/2" gap, due to the glass breaking and flying in my face. Thankfully the misses makes me wear goggles, safety first of course! Filling this in with Silastic will still keep it braced enough? And finally, I have done quiet a bit of reading on this and have seen mentioned in more than one FAQ that a light sanding is a good idea to help the silicone bond to glass, specifically to expose it to unfilled micro-pores. Is this incorrect? Just trying to make sure I understand before I get too far along. And the spacers seemed like they may work, or was that a bad idea as well? a try when I start setting it up. I am still working on getting it apart! I am now the crazy neighbor with the 10' fish tank in his front yard. I have a 30g glass aquarium that has a broken back panel. I would like to attach an overflow type filter to it post repair. I know that drilling a hole in tempered glass is just begging for catastrophe later. 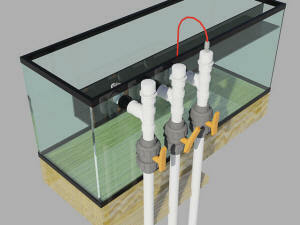 So I am wondering, if I were to replace the glass panel with an acrylic one would the seal hold with silicone. I ask because drilling overflow holes in acrylic just feels so much wiser but I don't have then money to go all acrylic. <Yes, Ben. It can be done. In years past, I've taken many an all-glass aquarium and broken out the bottom in order to replace it with an acrylic panel that I could drill to my heart's content. But I did it to the BOTTOM, because the bottom is supported on all 4 sides, usually in the middle and -if needed- I placed additional supports at 25% and 75%. <This is the "additional engineering" I mentioned. Optional: After my acrylic panel was in place with silicone seals dried and cured (research this site for glass panel replacement) I'd then use more silicone to attach some acrylic angle to the outside vertical stretches. If you can visualize this: a piece running up the side that would wrap around - overlap the side glass by an inch and the back acrylic by an inch. This would double the distribution of pressure on the sides. This is because I'm paranoid about water & fish on the floor, so I take extra care in such things. Thank you much for any help you can provide. I have a 125 gallon perfecto aquarium that has a broken side pane glass. I was able to remove the side pane with your great directions. The problem is as I remove the side glass I accidentally drop it on the floor. I was wondering if you know the exact dimension of the side glass pane so I can go get another one. Thanks and have a nice day. HELP! 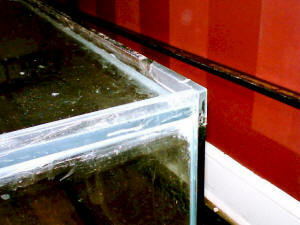 I have a 130 gal aquarium the bottom glass as a big crack in it was fill with water and fish's don't know how it happen. Can I just put some glass over it? P.S. I had it for three year's. It did not get bump why did this happen? there's no rock where the is crack. <Glass at the bottom typically cracks for one a few reasons: Something heavy fell on it, like a rock. Secondly, very hot water was poured on it. I have a question the front glass on my 150 gallon fish tank is cracked from top to bottom. I want to replace the glass. Where can I get this done and how much does it usually cost? <I recommend you either contact your local glass store. 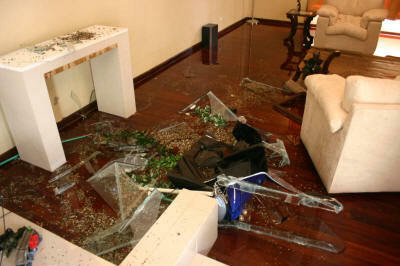 Or read up on WWM about how to replace glass panes yourself. Unfortunately with regards to cost, you will have to decide after you get a local quote if it is cost effective to replace the front pane. I was looking through Craigslist when I found an add for an 8 foot by 3 foot tank. for free. yeah. and I wanted to know if there where cheap yet aesthetic ways of dealing with it, or if I would have to replace that entire piece of glass. <A cracked tank is a broken tank, broken tanks do not hold water well. is sealed in both corners real good and I have been working it with razor blades and other blades but what is a quick way of doing it without hurting the bottom glass? Is there a repair place you can refer me to in my neck of the woods here in Tacoma, WA? <My neck of the woods is in MI, so I couldn't help you much there. I'd suggest getting in touch with local aquarium dealers and have them refer/repair. Have you read our articles/FAQ's on this subject? Go here.